4 Bedroom For Sale in Basildon for Guide Price £450,000. This stunning family home comes to market with no onward chain and is situated in the highly sought after area of Eversley. Offered to the market on a guide price of 450,000 to 500,000. The property is ideal for anyone looking at a commute into the city with the a mainline train station situated in close proximity and offers links to London via the C2C line. Other transport links include the A13 and A127 both with connectivity to London, the M25 and the Dartford Crossing. Internally the property has been maintained to a high standard and offers a host of fine features. 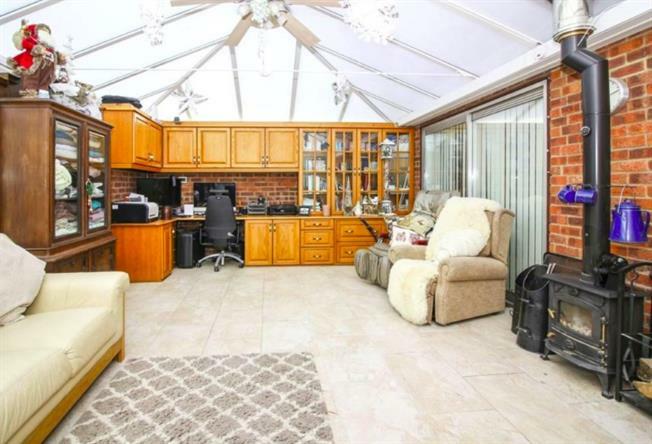 To the ground floor the property boasts a sizeable lounge that flows through to the dining room and conservatory creating a lovely area for entertaining family and friends. The properties modern kitchen features built in units to the wall and base as well as an island serving as a breakfast bar. There's also a downstairs WC while to the first floor there's a family bathroom the morning rush couldn't be easier. With four bedrooms all spread across the first floor two of which are double bedrooms with there own en-suite shower rooms. Externally the property offers a low maintenance rear garden that benefits from a stunning decking area perfect for relaxing in the evening and is barely overlooked. There's also a workshop to the rear and a shed with its own power supply. To the front of the property there's off street parking for numerous vehicles and a detached garage.